Degradation of bit-error-rate (BER), caused by atmospheric turbulence, seriously hinders the performance of coherent Free Space Optical (FSO) communication systems. An adaptive optics system proves to be effective in suppressing the atmospheric turbulence. The holographic modal wavefront sensor (HMWFS) proposed in our previous work, noted for its fast detecting rates and insensitivity to beam scintillation, is applied to the coherent FSO communication systems. In this paper, based on our previous work, we first introduce the principle of the HMWFS in brief and give the BER of the coherent FSO with homodyne detection in theory, and then analyze the improvement of BER for a coherent FSO system based on our previous simulation works. The results show that the wavefront sensor we propose is better for weak atmospheric turbulence. The most obvious advantages of HMWFS are fast detecting rates and insensitivity to beam scintillation. L. Wei, Y. Kainan, H. Danian, L. Xudong, W. Liang, and L. Yaowen, “Performance evaluation of coherent free space optical communications with a double-stage fast-steering-mirror adaptive optics system depending on the Greenwood frequency,” Opt. Express 24, 13288-13302 (2016). J. Ma, K. Li, L. Tan, S. Yu, and Y. Cao, “Performance analysis of satellite-to-ground downlink coherent optical communications with spatial diversity over Gamma-Gamma atmospheric turbulence,” Appl. Opt. 54, 7575-7585 (2015). D. Geng, P. Du, W. Wang, G. Gao, T. Wang, and M. Gong, “Single laser free-space duplex communication system with adaptive threshold technique and BER analysis in weak turbulent atmosphere,” Opt. Letters 39, 3950-3953 (2014). R. M. Rennie, D. Goorskey, M. R. Whiteley, and E. J. Jumper, “Wavefront measurements of a laser-induced break-down spark in still air,” Appl. Opt. 51, 2306-2314 (2012). W. Liu, W. Shi, J. Cao, Y. Lv, K. Yao, S. Wang, J. Wang, and X. Chi, “Bit error rate analysis with real-time pointing errors correction in free space optical communication system,” Optik 12, 324-328 (2014). S. Dongyiel, H. Y. Such, and C. J. Woo, “4×10 Gb/s terrestrial optical free space transmission over 1.2 km using an EDFA preamplifier with 100 GHz channel spacing,” Opt Express, 7, 280-284 (2000). Q. Yang, J. Zhao, M. Wang, and J. Jia, “Wavefront sensor-less adaptive opitcs based on the trust region method,” Opt. Letters 40, 1235-1237 (2015). J. Cao, X. Zhao, Z. Li, W. Liu, and Y. 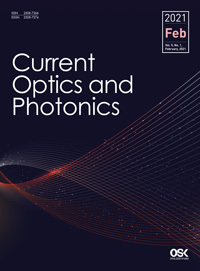 Song, “Stochastic parallel gradient descent laser beam control algorithm for atmospheric compensation in free space optical communication,” Optik 125, 6142-6147 (2014). H. Linhai and C. Rao, “Wavefront sensor-less adaptive optics: a general model-based approach,” Opt. Express 19, 371-379 (2011). J. Ma, F. Zhao, L. Tan, S. Yu, and Y. Yang, “Degradation of single-mode fiber coupling efficiency due to localized wavefront abrerrations in free-space laser communications,” Opt. Eng. 49, 1-6 (2010). A. Belmonte, A. Rodríguez, F. Dios, and A. Comeón, “Phase compensation considerations on coherent, free-space laser communications system,” Proc. SPIE, 6736, A-11 (2007). A. Belmonte, “Influence of atmospheric phase compensation on optical heterodyne power measurements,” Opt. Express 16, 6756-6767 (2008). L. Zuo, Y. Ren, A. Dang, and G. Hong, “Performance of coherent BPSK systems using phase compensation and diversity techniques,” in Proceedings of IEEE Conference on Global Telecommunications , 1-5 (2010). L. Zuo, A. Dang, Y. Ren, and H. Guo, “Performance of phase compensated coherent free space optical communications through non-Kolmogorov turbulence,” Opt. Commun. 28, 1491-1495 (2011). M. Li and M. Cvijetic, “Coherent free space optics communications over the maritime atmosphere with use of adaptive optics for beam wavefront correction,” Appl. Opt. 54, 1453-1462 (2015). C. Liu, S. Chen, X. Li, and H. Xian, “Performance evaluation of adaptive optics for atmospheric coherent laser communications,” Opt. Express, 22, 15554-15563 (2014). C. Liu, M. Chen, S. Chen, and H. Xian, “Adaptive optics for the free-space coherent optical communications,” Opt. Commun. 361, 21-24 (2016). H. Jian, D. Ke, L. Chao, Z. Peng, J. Dagang, and Y. Zhoushi, “Effectiveness of adaptive optics system in satellite-to-ground coherent optical communication,” Opt. Express, 22, 16000-16007 (2014). J. Huang, H. Mei, K. Deng, L. Kang, W. Zhu, and Z. Yao, “Signal to noise ratio of free space homodyne coherent optical communication after adaptive optics compensation,” Opt. Commun. 356, 574-577 (2015). W. Liu, W. Shi, B. Wang, K. Yao, Y. Lv, and J. Wang, “Free space optical communication performance analysis with focal plane based wavefront measurement,” Opt. Commun. 309, 212-220 (2013). F. Ghebremichael, G. P. Andersen, and Kenneth S. Gurley, “Holography-based wave-front sensing,” Appl. Opt. 47, A62-A69 (2008). G. P. Andersen, L. Dussan, F. Ghebremichael, and K. Chen, “Holographic wave-front sensor,” Opt. Eng. 48, 085801 (2009). G. P. Andersen, F. Ghebremichael, and K. S. Gurley, “Fast Computing-Free Wave-front Sensing,” Adaptive Optics: Methods, Analysis and Applications 18, AWC4 (2007). S. K. Mishra, R. Bhatt, D. Mohan, A. K. Gupta, and A. Sharma, “Differential modal Zernike wavefront sensor employing a computer-generated hologram: a proposal,” Appl. Opt. 48, 6458-6465 (2009). R. Bhatt, S. K. Mishra, D. Mohan, and A. K. Gupta, “Direct amplitude detection of Zernike modes by computer-generated holographic wavefront sensor: Modeling and simulation” Optics and Lasers in Engineering, 46, 428-439 (2008). L. Changhai and J. Zongfu, “Holographic Modal Wave-front Sensor: Theoretical Analysis and Simulation,” Chinese Journal of Lasers 36, 147-152 (2009). L. Changhai, X. Fengjie, M. Haotong, H. Shengyang, and J. Zongfu, “Modal wave-front sensor based on binary phase-only multiplexed computer-generated hologram,” Appl. Opt. 49, 5117-5124 (2010) . L. Changhai, X. Fengjie, H. Shengyang, and J. Zongfu, “Performance analysis of multiplexed phase computer-generated hologram for modal wave-front sensing,” Appl. Opt. 50, 1631-1639 (2011). W. Liu, W. Shi, K. Yao, J. Cao, P. Wu, and X. Chi, “Fiber Coupling efficiency analysis of free space optical communication systems with holographic modal wavefront sensor,” Opt. Laser Technol. 60, 116-123 (2014).